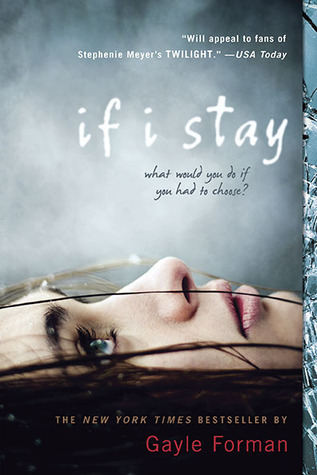 Laura has been on a quest, a quest to acquire a hardcover of the fabulous novel, If I Stay by Gayle Forman. But she doesn’t want just any hardcover, she wants this edition. Unfortunately, it shares an ISBN with the newer edition, which looks like this. So Laura keeps ordering the book, and keeps getting the wrong version. Well, her loss is your gain, because Laura can’t send back yet another copy of If I Stay, so as a little “thank you” to our lovely readers, we’re giving one of you this copy. I really, really liked If I Stay, but the sequel, Where She Went is one of my favorite books ever (the bridge scene! **sob**), so I’m always pushing this series on people. I’m hoping that whomever win this book will get hooked and pick up the second too. Okay, so it’s really, really easy to win If I Stay. All you need to do is leave a comment on this post, telling us what book you love to badger people into reading. For me, it’s always and forever Jellicoe Road. That book just kills me in the best way. You don’t need to like us on Facebook, tweet about the giveaway or anything like that, just leave a comment, easy-peasy. I’ll draw a winner on December 15, 2012. I’m going to have to restrict this to US and Canadian entries due to postage costs. (Sorry!) If you’d like to leave a comment anyway, just let me know not to include you in the drawing.